One of the very famous Indian actresses Amrita Singh mesmerized audience with her unique beauty and charm. The actress was born on February 9, 1958 in Hadali (Punjab province of Pakistan). Amrita comes from a mixed parentage; her father, Shavinder Singh is a Punjabi, while her mother's name is Rukhsana Sultana. Her father was an Army Officer and mother was a political activist. Amrita's family has relations with great novelist Khushwant Singh. Amrita was the student of New Delhi-based Modern School. The actress can speak fluently in languages like Hindi, English and Punjabi. Dingy is the nickname of the actress. Amrita Singh was one of the most sought-after actresses of her time. She fearlessly and convincingly played negative roles in her career shot. Amrita was the only heroine, who was seen in the lead roles with Dharmendra as well as with his son Sunny Deol. She has even received praises for her dedication towards the work. The fabulous actress stepped in Bollywood with the film 'Betaab' in 1983. Sunny Deol was her co-star in this film. Post this film, Amrita continued giving hit films at the box-office, like 'Sunny' in 1984, 'Mard' and 'Saaheb' in 1985, 'Chameli Ki Shaadi' and 'Naam' in 1986 and 'Khudgarz' in 1987. Amrita was someone, who would look good when paired with any co-actor, be it Sunny Deol, Sanjay Dutt, Anil Kapoor or Shehenshah Amitabh Bachchan. 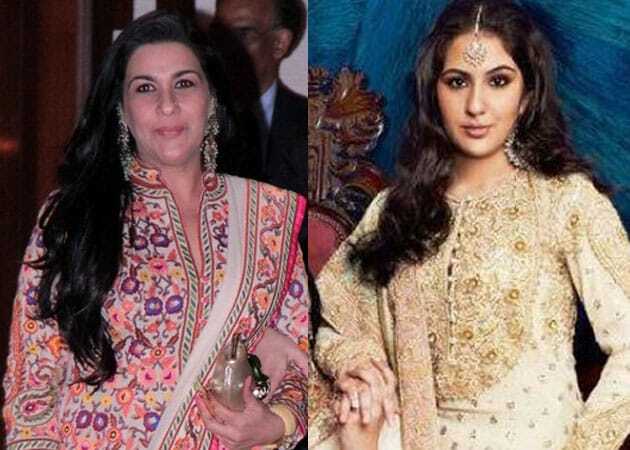 Amrita Singh tied the knot in 1991 with Bollywood actor Saif Ali Khan, son of yesteryears' actress Sharmila Tagore. Saif Ali Khan is around twelve years younger than Amrita Singh. Saif and Amrita have two kids, Sarah Khan and Ibrahim Khan. The couple finally separated in the year 2004. The brilliant actress also essayed some negative roles in the films like 'Raju Ban Gaya Gentleman' (1992) and 'Aaina' (1993). Amrita Singh displayed gray shades in it. For 'Aaina', the actress won the title of Filmfare Best Supporting Actress. Amrita thought of leaving acting field after year 1993. In the year 2002, the actress returned to the big screen. Her comeback film was '23rd March 1931 Shaheed', in which Bobby Deol was seen as Bhagat Singh. Amrita played the role of mother of Bhagat Singh in this movie. Then, she appeared on small screen with TV serial 'Kkavyanjali' aired on Star Plus in the year 2005. In the same year, Amrita performed in the movie 'Kalyug', as Simi Roy. Her role in 'Kalyug' showered her much praises. In 2007, the actress played a prominent role in memorable movie 'Shootout At Lokhandwala' by Sanjay Gupta. She portrayed the role of mother of gangster, Maya Dolas. Apoorva Lakhia was the director of this thriller. Vivek Oberoi enacted Maya Dolas in 'Shootout At Lokhandwala'. The multifaceted actress did a short role in another flick named 'Dus Kahaniyaan' in 2007. The next movie done by Amrita in her acting journey was 'Kajraare' in the year 2011. The other significant movies in which Amrita Singh acted in are 'Duniya', 'Mera Dharam', 'Kala Dhanda Goray Log', 'Karamdaata', 'Naam O Nishan', 'Thikana', 'Kabzaa', 'Tamacha', 'Shukriyaa', 'Charanon Ki Saugandh', 'Agnee', 'Sachai Ki Taqat', 'Hathyar', 'Galiyon Kaa Badshah', 'Ilaaka', 'Batwara', 'Toofan', 'Jaadugar', 'Veeru Dada', 'Aag Ka Darya', 'Krodh', 'C.I.D', 'Sadhu Sant', 'Paap Ki Aandhi', 'Suryavanshi', 'Dil Aashna Hai', 'Rang', etc. Now, the viewers will once again get to see Amrita Singh in the forthcoming film 'Aurangzeb' (2013). Reportedly, she will be seen with Jackie Shroff in this movie. Amrita made her Bollywood debut in 1983 with Betaab, a vastly successful film in which she was paired with Sunny Deol. This was quickly followed by a succession of hits, such as: Sunny in 1984, Mard (which was the biggest hit of that year) and Saaheb in 1985, Chameli Ki Shaadi and Naam in 1986, Khudgarz in 1987, etc. Amrita made a successful pair in several films not only with Sunny Deol and Sanjay Dutt, but also with Anil Kapoor and Amitabh Bachchan, two leading actors of the 1980s. As well as playing leading roles, she also played supporting negative roles in films such as Raju Ban Gaya Gentleman (1992) and Aaina (1993). She also won the Filmfare Best Supporting Actress Award for the latter. These successes did not dissuade her from her resolve to retire into family life and Amrita quit acting after 1993.She returned to acting in 2002 with the film 23rd March 1931: Shaheed, in which she played the mother of Bhagat Singh (played by Bobby Deol). She then appeared on the STAR Plus television serial, Kkavyanjali, in 2005. Later that year, she won acclaim for her performance in yet another negative role for the film Kalyug. In 2007, Amrita played the role of the gangster Maya Dolas' mother, Ratnaprabha Dolas, in the Sanjay Gupta film Shootout at Lokhandwala, directed by Apoorva Lakhia. Vivek Oberoi played the role of Maya. Later on Amrita appeared in the anthology film Dus Kahaniyaan, where she appeared in the short story Poornmasi. Continuing her acting journey, Amrita played in the film Kajraare in 2010 and recently appeared in Aurangzeb under the Yash Raj Films banner where she was paired with Jackie Shroff after almost two decades. In 2014 she was seen in the movie 2 States produced by Dharma Productions portraying the role of co-actor Arjun Kapoor's mother. Film released on 18 April 2014. In 1991, Amrita married Saif Ali Khan. He is the son of cricketer Mansoor Ali Khan Pataudi, the Ninth Nawab of Pataudi and actress Sharmila Tagore. In 1993, she gave up acting for a family life with her husband. Together they have two children, a daughter named Sara Ali Khan (born September 1993) and a son named Ibrahim Ali Khan (born October 2001). She was seen as part of a Marathi Nrutya-Naatika (Dance-Play). Saif attended the show to see his daughter's dance performance. After thirteen years of marriage, they divorced in 2004.Amrita Singh married twelve years younger actor Saif Ali Khan in the year 1991 and is the mother of two children, daughter, Sara Ali Khan, and a son, Ibrahim Ali Khan. 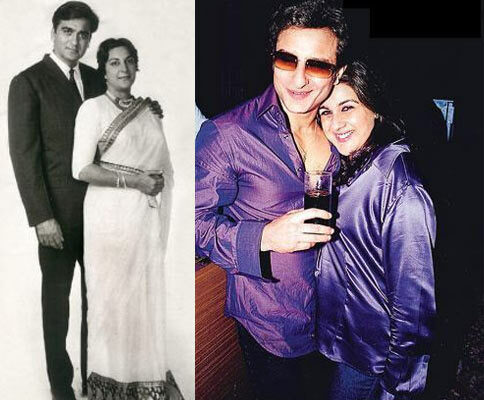 Amrita Singh and Saif Ali Khan divorced in the year 2004 and Amrita now stays with her two kids. Saif Ali Khan is the son of well known actress Sharmila Tagore and cricketer Mansoor Ali Khan, Nawab of Pataudi. Saif’s younger sister, Soha is also a bollywood actress. After courting an Italian model, Roza for a couple of years, Saif is now dating bollywood diva Kareena Kapoor.One of the most attractive actresses of eighties, Amrita has experimented with all kind of roles in different genres of cinema. Moreover she is the only actress to have played the female lead with actor Dharmendra as well as his son Sunny Deol. She has also worked alongside Dharmendra’s other actor son Bobby Deol in ‘23rd March 1931: Shaheed’, wherein she played his mother.A dedicated Bollywood actress, Amrita has worked in a number of successful films alongside top bollywood stars. It is believed that Amrita’s mother had a great command on Amrita and her bollywood career. In fact, her mother Rukhsana Sultan tried to influence B.R. Chopra to cast Amrita in his film ‘Nikaah’. Chopra was in search of a fresh face for ‘Nikaah’ and had already rejected Zeenat Aman who had previously appeared in ‘Insak ka Tarazu’. Chopra finally chose British raised Salma Agha for the lead role in ‘Nikaah’. Bothered by this decision, Amrita’s mother sent letters to Salma Agha threatening her to refuse the film and go back to London. However it did not work in favor of Amrita and Salma Agha appeared in the mega success ‘Nikaah’. Amrita made her debut in Rahul Rawail’s ‘Betaab’ opposite new comer Sunny Deol. Released in the year 1983, ‘Betaab’ was a love story that won five nominations at the Filmfare. The film became a huge box office success and Amrita won over the audiences with her varied performance. Amrita Singh incredibly paired with superstars Amitabh Bachchan, Anil Kapoor, Sanjay Dutt and Sunny Deol. Some of her landmark films include Manmohan Desai’s ‘Mard’, Anil Ganguly’s ‘Saaheb’, Basu Chatterjee’s ‘Chameli ki Shaadi’, ‘Naam,’ Rakesh Roshan’s ‘Khudgarz’. Amrita Singh won accolades for her performance in negative roles in ‘Raju Ban Gaya Gentleman’ and ‘Aaina’. After marrying Saif Ali Khan in 19991, Amrita resolved to take a respite from films. However Amrita returned to Bollywood in the year 2002 with ‘23rd March 1931: Shaheed’, where she portrayed the character of Bobby Deol’s mother. She was later seen in Mohit Suri’s ‘Kalyug’ in the negative lead. Amrita Singh also worked in supporting roles in films like ‘Shootout at Lokhandwala’ and ‘Dus Kahaniyan’. Amrita Singh joined the television industry with Ekta Kapoor’s family drama ‘Kavyanjali’ aired on Star Plus. Amrita was seen in a negative role in the show that soon gained immense popularity. Amrita is currently working on a Bollywood project, called ‘Kajraare’ produced by T-Series and directed by Pooja Bhatt. Starring Himesh Reshammiya and Mona Liza in the leading roles, the film is supposedly a remake of 1991 release ‘Sadak’.